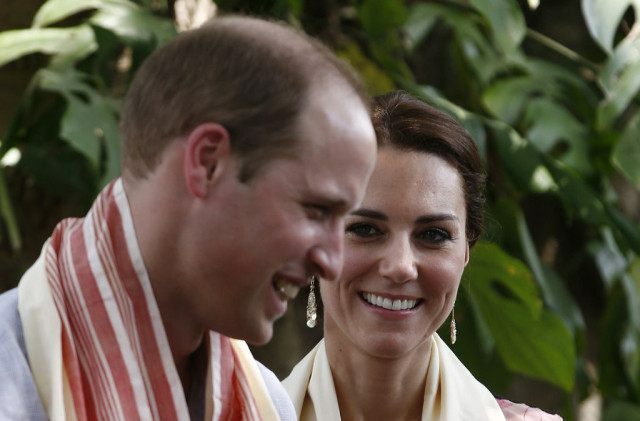 GAUHATI, India (AP) — The Duke and Duchess of Cambridge are the guests of the king and queen of the Himalayan nation of Bhutan, both young royal couples who have much in common. Prince William and his wife, the former Kate Middleton, stepped from their jet onto the airport tarmac on a windy Thursday morning in the picturesque hilltop resort town of Paro. The British royals were ushered by traditional dancers, flag-bearers, pipers, drummers and Buddhist monks down a 500-meter (1,600-foot) walkway to the 13th-century royal fortress to meet Bhutan’s King Jigme Khesar Namgyal Wangchuck and Queen Jetsun Pema, who are wildly popular in the nation of 800,000. The royal pairs posed for photos in front of a statue of the laughing Buddha before going inside. Later, Will and Kate were visiting Thimphu’s open-air archery venue, with archers aiming at very small, brightly decorated wooden targets positioned 145 meters (476 feet) from where they stand. In the evening, they will meet the Bhutanese royal couple’s baby, born in February, and dine with Bhutan’s king and queen. “Two of the world’s young royal couples are meeting. It’s a great message of friendship to the international community,” said Tenzin Lekphell, who heads a management institute in Thimphu. On Friday, the British royal couple will hike to a Buddhist monastery called Tiger’s Nest, perched at an altitude of 3,000 meters (10,000 feet), though there will be ponies on standby to help carry them should they tire on the trek. William’s father, Prince Charles, had planned to make the same hike in 1998 but was injured in a polo match so instead stopped before the ascent and painted a scenic picture in watercolors. The visit “is a symbol of the centuries-old relationship between Bhutan and the UK,” said Michael Rutland, who has lived in Bhutan since the 1970s and serves as honorary UK consul in the country. In 1910, the two sides signed a treaty guaranteeing the British would not interfere in Bhutan provided the small nation on the northern border of what was then the British Empire in India accepted advice on external relations. The two young couples have much in common. Both were married in 2011, and both Kate and Jetson Pema did not come from royal families. The Bhutanese queen’s father is a pilot, though her mother has royal lineage.